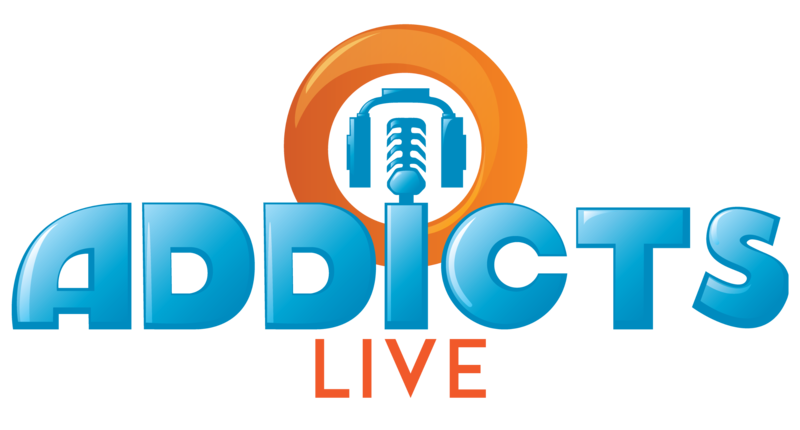 Hey howdy hey Addicts! In the steady grind of tapping in the free world, we sometimes see decorations and buildings and take them for granted. 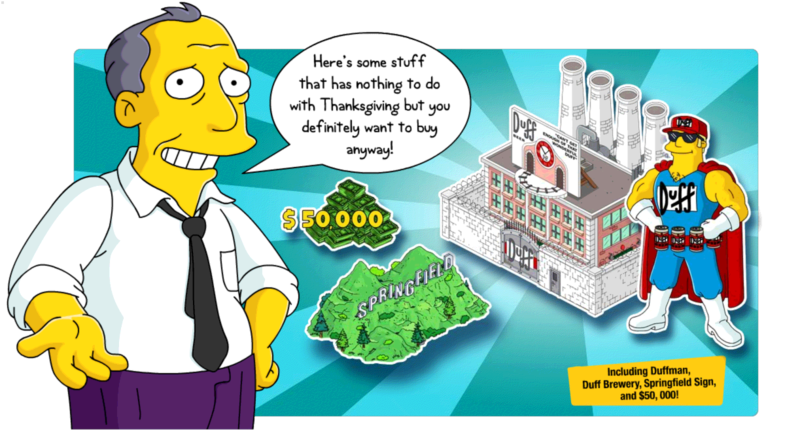 While this is understandable, we may not realize that a great majority of items in TSTO actually come from the amazing show the game is based on. With that in mind, Bunny and I aim to periodically provide you the origin info for decorations and buildings we missed, ignored or haven’t covered yet. Time is a fickle thing (timey wimey even) and as Einstein said, “The only reason for time is so that everything doesn’t happen at once.” There’s often not enough time in the TSTO continuum to do origins for everything, but while we have some, we’ve called on Mr. Peabody to help us along. We’re using his WABAC (pronounced way back) Machine to go back in TSTO time. With that premise, we bring you WABAC WDTCF (Where Did THAT Come From). This particular journey is for the Carved Ice Sculpture and Weather station. Well it’s Thanksgiving Eve and did you really think EA would let Thanksgiving go by with out some kind of holiday tie in? This year it looks like we get not one but TWO holiday events. The first tomorrow, on Thanksgiving Day, and the second on Friday, Black Friday here in the US! 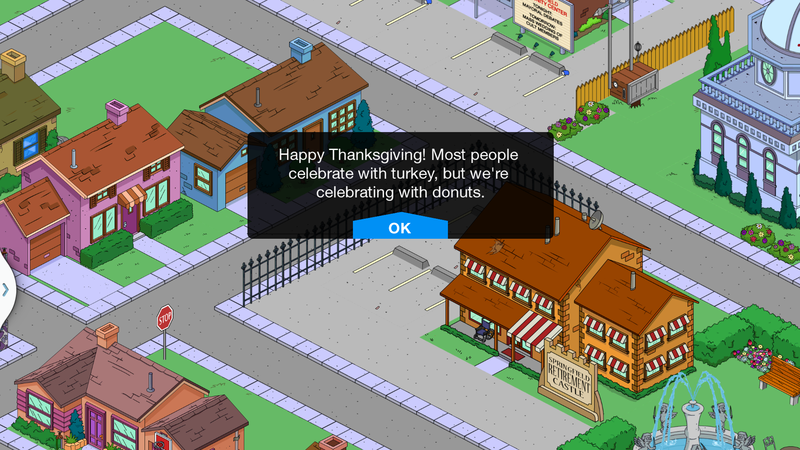 From what we can tell from the game files, it looks like FREE DONUTS will be the reward on Thanksgiving and on Friday it looks like Ole’ Gil will finally make his long awaited Duff Promotion appearance in the game! Note: If you already have either the Springfield Sign OR the Duff Brewery this offer WILL NOT appear in your Springfield. As is our customary deal we won’t post information about the update itself until it actually hits. Once the update hits the game (should be sometime Thursday November 28th) we will update all of the details on this post. So be sure to check back for more details later! UPDATE: The Thanksgiving bonus is live in the game! Should auto start for you with a Happy Thanksgiving Message! 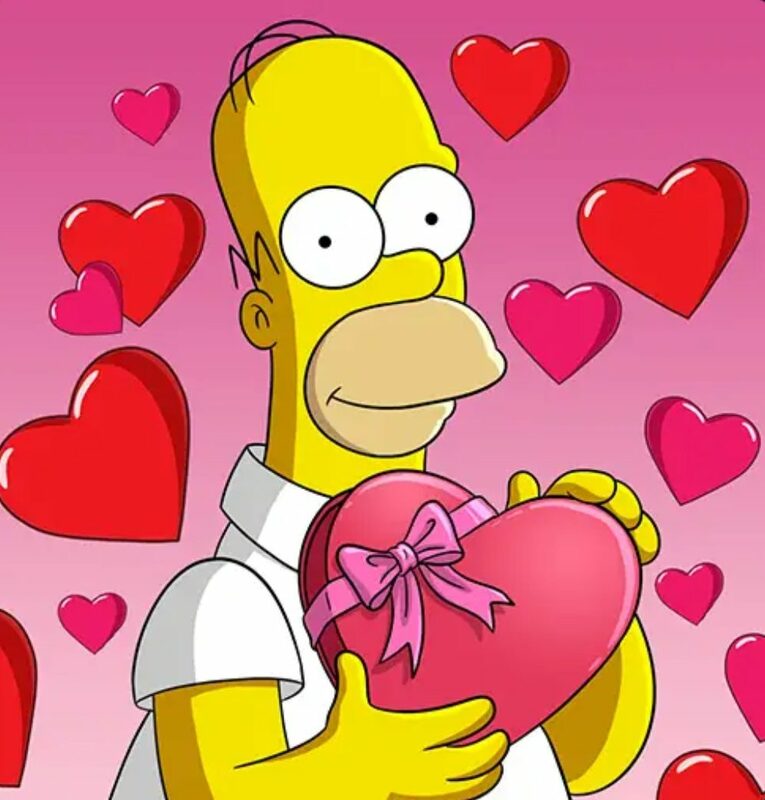 Be sure Homer is free! Note: I play on both a Android phone (my A game) and an Android tablet (my B game). For my A game, on my phone, it started right up. However, on my B game, tablet, the quest didn’t auto start. I had to back out of the app and hard close it (close apps) and restart TSTO. So if you don’t see it auto start for you try hard closing and restarting the app. Homer: Oh my God! We go three donuts just because of what day it was? 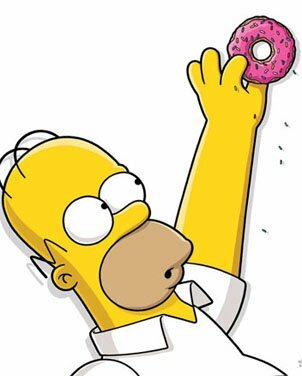 I wonder if we could reset the clock on our device, then when the machine thinks it becomes today again, we’ll get another three donuts! Lisa: Wouldn’t that be cheating? Homer: No, cheating is when you press a bunch of buttons and get unlimited ammo. This is hacking! Lisa: That took you a long time, Dad. Normally when you play with your myPad it’s just for a couple seconds. Homer: I can’t believe that trick worked. Now we can get unlimited donuts! Lisa: But Dad, that would be unethical. Besides, wouldn’t it ruin the fun of the game? Homer: The fun of always having to wait 24hours? The fun of not being able to afford things? The fun of not being able to grow crops because my corn still needs 50 days? Screw fun — I’ll take the unlimited donuts. And more importantly, I can post a video of me doing it on the Internet and get like a zillion views! Finally people will realize I’m a genius at computering! Lisa: Wow Dad, your “How to get Unlimited Donuts” video is getting a lot of hits. Homer: I know. Move over “Puppy on a Piano” — there’s a new Most Watched Video in town! I’m an Internet Celebrity– and that never goes away! Lisa: The only problem is, the popularity of your video is sure to attract the attention of EA. Lisa: I bet they can put out a patch that fixes that problem pretty quickly. Lisa: In fact, I bet they’re doing it right now. Homer: AUGHHH!!! Where’s my myPad?! I’ve got to get my donuts! Gil: Hey folks, Thanksgiving’s over! Which means it’s a salesman’s favorite of days…Black Friday. Homer: Oh no, they fixed my hack. And even worse, Gil’s here. I hate this stupid game! Lisa: There’s probably a lesson to be learned in here about cheating. Homer: There sure is. If you do it, don’t post it online until you’ve fully exploited it for yourself. Lisa: That’s not what I meant. Homer: I wonder if I could have still selected “Reset the Clock” from my job list when my quests was “Post Hack on the Internet”? 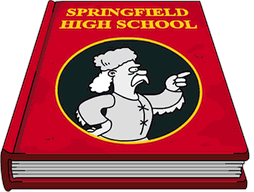 At this point if you don’t already have the Duff Brewery and the Springfield Sign Gil will show up with his offer as indicated above. If you have 1 (or both) of those Gil will not appear in your game and you’re Thanksgiving and Black Friday quests are complete.